NASA now have the Presidential Flagbearer, only waiting to be made official. - Bana Kenya News, Real African Network Tubanane. Home featured News NASA now have the Presidential Flagbearer, only waiting to be made official. NASA now have the Presidential Flagbearer, only waiting to be made official. The Machakos Senator Johnstone Muthama has announced that the Deal of selecting the NASA flag bearer is now closed. The happy Muthama said that the Coalition top leadership have agreed who take up the incumbent president during general elections. The Machakos senator did not give hint on who is the flag bearer but he said that the names will be given out before the end of March. Today, the NASA coalition will hold a rally at Nairobi where a big announcement is anticipated. The Machakos Senator who is a member of the National Coordinating Committee said negotiations to pick a NASA’s flag-bearer are complete and already have a candidate, only waiting to officialise the name. He said " Our work is concluded, we are just waiting the day we will make the name public. We have drawn a structure of our government as well. We are so optimistic that the next government is ours and for Kenyans. We have included all the tribes as per our coalition objectives." 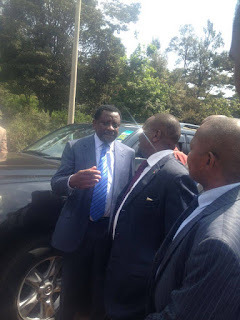 The committee comprised of the Machakos senator Johnstone Muthama who represented Wiper, Siaya Senator James Orengo who represented ODM, Dr Boni Khalwale (Kakamega, Ford-K), and MP Sakwa Bunyasi (Nambale, ANC). Other Members who also took part in the talks includes Francis Nyenze (Kitui West, Wiper), Eseli Simiyu (Tongaren) and Chris Wamalwa (Kiminini) of Ford-K and ODM’s Timothy Bosire (Kitutu-Masaba) and Dr Agnes Zani (nominated). It also featured former MPs Farah Maalim and Kipruto Arap Kirwa.